Previously sold in these Rooms, 31 October 1994, lot 542A. This elegant meiping is a classic example of fine Yuan dynasty blue and white porcelain. The form is well-proportioned and strongly potted. 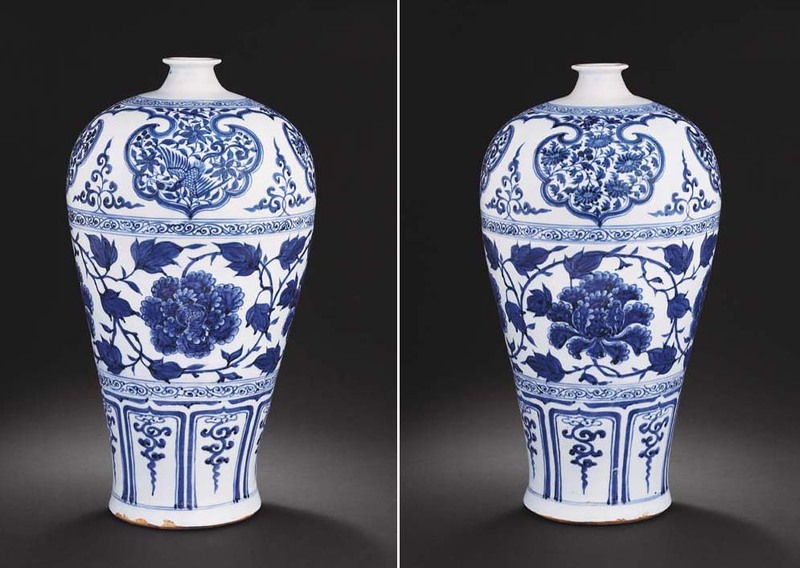 It is decorated in the rich cobalt-blue that had to be imported at great expense in the Yuan period. The banded design makes good use of the extensive canvas provided by the vase's form, and the three major decorative bands are in pleasing contrast to one another. They include three of the most successful motifs of the 14th century: the large-scale cloud collar, the bold peony scroll and the petal panels. A meiping with near-identical decoration to the current example is in the collection of the Ardebil Shrine, now in the Iran Bastan, Tehran, illustrated by J. A. Pope, Chinese Porcelains from the Ardebil Shrine, London, 1981, pl. 25, no. 29.412. A vase with a somewhat smaller scale, more loosely painted peony scroll in its middle band, formerly in the collection of Mrs Alfred Clark, is illustrated by Sir Harry Garner, Oriental Blue and White, London, 1964, pl. 17; while another of similar proportions in its motifs as the Clark vase is in the collection of the Metropolitan Museum of Art, New York, illustrated in Oriental Ceramics, Kodansha Series, vol. 12, Tokyo, 1982, col. pl. 28. Another vase from this group, from the collection of the late S. H. Pao, was sold at Sotheby's London, 15 April 1980, lot 237. A meiping with slightly more sloping shoulders and lacking the scrolls alternated with the cloud collar, from the Chang Foundation, Taiwan, is illustrated in Selected Chinese Ceramics from Han to Qing Dynasties, Taiwan, 1990, pl. 72. Another group of meiping share very similar motifs with the present vase, but instead of phoenix within the cloud collar, they are painted with two species of flowers alternately shown. One is in the collection of the Museum of Fine Arts, Boston, illustrated in Oriental Ceramics, Kodansha Series, vol. 11, Tokyo, 1980, col. pl. 74; one was included in the Hong Kong Museum of Art exhibition Chinese Porcelain, The S. C. Ko Tianminlou Collection, 1987, illustrated in the Catalogue, Part 1, pl. 4; and another, with a cover, from the Su Lin An Collection, was sold at Sotheby's Hong Kong, 31 October 1995, lot 308, and again, in these Rooms, 7 July 2003 (Catalogue dated 28 April 2003), lot 640.